This coming weekend marks the running of the Pikes Peak Ascent and Marathon, and for that reason I'm going to break my rule to only feature records south of Highway 50. As a flatlander runner, who usually crosses the finish line of a half marathon in just barely under three hours, I am in awe of anyone who can put one foot in front of the other and scale up one and a half vertical miles in oxygen-deprived surroundings. Is the feat crazy? Probably. I nonetheless applaud the physical and mental fortitude it takes to do it. Since I could never run a half marathon fast enough to qualify for the Ascent (believe me, I've tried), I will always live vicariously through those who do. Last September, while visiting family back home in Pueblo, I drove up to Manitou Springs. I parked the car and stood across from Memorial Park, which marks the starting point of the annual race. Walking up Manitou Avenue, I decided to see how far I could go along the race route. By the time I got to Ruxton Avenue, not even a mile away, I wanted to collapse. Back in the car, and just a few miles from the town, I spotted a thrift store. While digging for additions to the blog, I found this record. After my ill-attempt at following in the footsteps of those more physically capable, the title made me smile. Listen to "On Top of Pikes Peak"
Billy Briggs (1919-1984) began his musical career in 1937, as a bass and steel guitar player with The Sons of the West, and The Hi-Flyers, both western swing groups based out of the Texas Panhandle region. 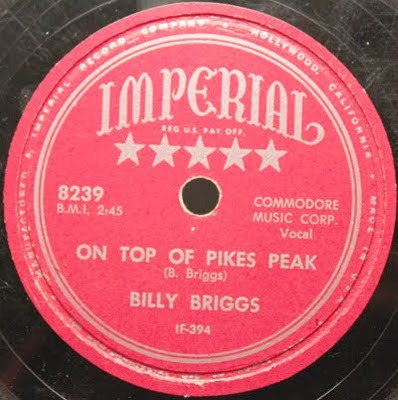 By 1947 he fronted his own group, Billy Briggs and his XIT Boys. 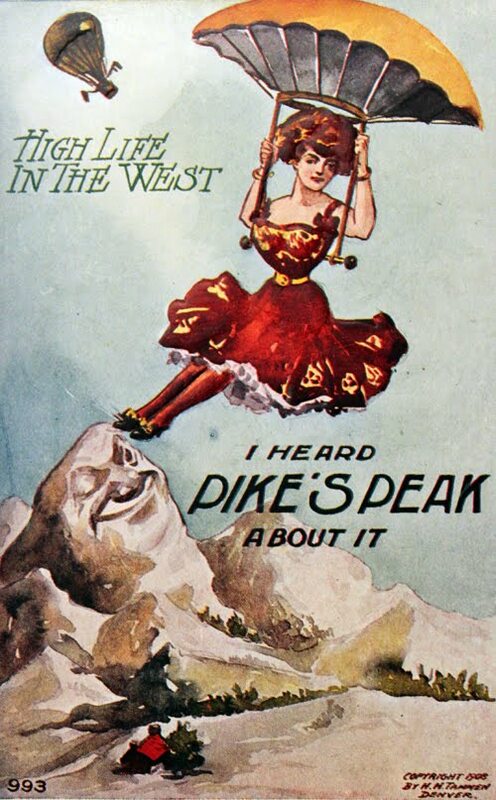 "On Top of Pikes Peak" was one of his last recordings, before he left the music industry. COMING NEXT POST: Ring ring goes the bell.